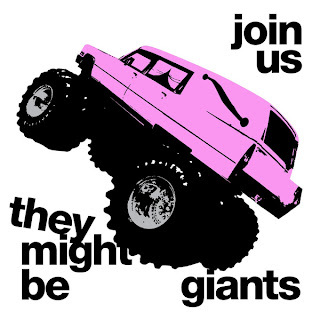 They Might Be Giants, or TMBG to their friends, are perhaps pop music’s most well-known cult act. They’ve been running unimpeded for three decades now, under no-one’s creative demands but their own, producing an overwhelmingly prolific body of work in the process. A prodigious history that includes fifteen(!) studio records, at least three children’s albums, and one very catchy TV theme tune (Malcolm In The Middle trivia fans); and yet, as treasured as they are to their fans they equally are an alternative musical cornerstone that many remain blissfully unaware of. Join Us, the group’s first ‘serious’ album since 2007’s The Else, makes no concessions to the uninitiated. It’s a product clearly tilted towards the converted, adding another eighteen tracks to the group’s already heaving back-catalogue, but at its heart it may well be the band’s most all-encompassing and accessible set since the turn of the decade. The core creative bureaucracy of TMBG, Johns Flansburgh and Linnell, have revived the economic simplicity of their singular style. Specifically, brilliantly arranged and crafted pieces disguised as kooky, inventive three-minute pop songs. Something the pair churned out regularly in their nineties hey-day, and is not a craft they’ve ever really neglected, but Join Us finds them back to their most delightfully succinct. There’s not a second wasted in the record’s 47 minute running time, and only one track strays from the sub-three minute dogma. This sheer efficiency is camouflaged however, by the pure fun and celebrated weirdness of their strange subject matter. Where else but in their playful musical world will you hear jubilant wordplay about stating the obvious (You Probably Get That A Lot), to verses sung from the perspective of a raindrop (Cloissoné), or voiced film noir script annotations (Protagonist). It would all seem wilfully quirky if it wasn’t for the robust musical vehicle that drives it all. Influenced by the twin poles of their American power-pop forebears (Big Star, Supertramp), as well as the genre-shifting English masters (The Beatles, Bowie). Chiefly, the influence of their beloved New Wave eccentrics XTC, whose way with pairing humour and pathos has been passed down to TMBG through a sort of musical genetic heritage. Essentially, it’s a love of melody, craft and arrangement paired with a zeal for classic instrumentation. It’s all there in the likes of Let Your Hair Hang Down and When You Will Die, as they swirl around ‘the Two Johns’ cascading harmonies accompanied by choppy, upbeat guitar in the former and spritely brass and a band roll-call in the latter. Elsewhere, TheLady and the Tiger begins with a red herring lazy rap before featuring a round of nasty brass that’ll stick in your head for days on end. Meanwhile, Dog Walker balances their way with experimentation and parody with auto-tuned vocals, broken beats and lines like ‘showdown at the battery farm.’ Then the final track, You Don't Like Me, has the audacity to take a list of 'likes' as its lyrics, “you like shadow puppets/Woody Harrelson/reading in the bath/ Nirvana and baseball caps,” finishing the record in a shimmy of stylistic panache. The results will do little to sway those already immune (or ignorant) to their idiosyncratic charm, but for those already won over, Join Us is a brilliant reminder of their unique appeal.